The Fine Gael leader says the party’s plan to shed 30,000 state workers would cost €1bn, but save €10bn in five years. FINE GAEL leader Enda Kenny has admitted that this party would need to borrow around “a billion” euro in order to lay off the 30,000 public service workers that the party wants to drop under its plan for public sector reform. Speaking at a press conference outside his party’s election headquarters in Dublin this morning, Kenny said that the party’s public service reform proposals – which would see thousands of staff laid off from the sector as part of a cost-cutting, efficiency drive – would see Ireland footed with a bill for hundreds of millions. While Kenny said he was reluctant “to give an absolute figure” for the costcutting proposals, a “ball park figure” suggested that the cost “could be as high as a billion” euro in redundancy payments. His estimate of the cost – which would be “somewhere between €800m and a billion” – had been extrapolated from the cost of the HSE’s recent redundancy programme, which had sought to lose 5,000 staff at a cost of about €400m. The party defended the need to have to borrow such sums to lay off workers, with enterprise spokesman Richard Bruton saying borrowing and spending of that nature wasn’t counted as day-to-day borrowing under European Union rules, as it was considered necessary to introduce savings. As a result, the borrowing would not be counted towards Ireland’s 2015 deadline for bringing its budget deficit back within European Union rules. Bruton said the party’s reform proposals would see the abolition of “over 145″ quangos and state bodies, including the HSE, and the streamlining of processes such as the creation of a single Public Entitlement Service, Business Inspectorate and Licence Authority. The party would lose 4,500 administrators in each of the next four years, it said, on top of the 12,000 job cuts already being pursued by the current government. The redundancy plan would save up to €10bn over five years, the party said. At the same press event, Kenny said he wished Micheál Martin and Eamon Gilmore well in their TV3 debate tonight, and said the two could “have a good fireside chat” ahead of their “five-star debate” on RTÉ next Monday, and the three-way debates in both English and Irish in the days that followed. Kenny insisted he was “most certainly not” afraid of debating the other party leaders at the open-air press conference, which had been attended by a volunteer for an opposing party wearing a chicken costume – a chicken RTÉ’s Bryan Dobson later said was sent by The Sun newspaper. The Fine Gael leader will miss tonight’s debate having scheduled a ‘Town-Hall Style’ meeting in Carrick-on-Shannon, Co Leitrim, which he said would be streamed live online so that emigrants could watch it. Email “Kenny: FG would borrow €1bn to lay off 30,000 public servants”. 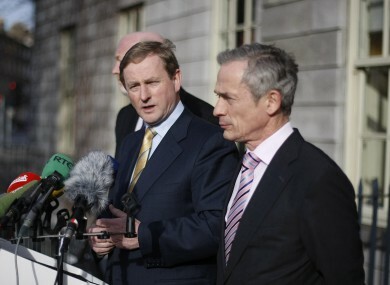 Feedback on “Kenny: FG would borrow €1bn to lay off 30,000 public servants”.